Where do the satellites galaxies come from ? Many small galaxies called "dwarf galaxies" are found orbiting massive galaxies like our Milky Way. They all contain less than one billion stars, hundred time less than the massive galaxies. Where do these tiny galaxies come from ? In standard cosmological scenarios, they are assumed to be formed early in the history of the Universe but high resolution numerical simulations performed by a team from the Paris Observatory and the Astrophysical Department of CEA/DAPNIA now show that things are not so simple. 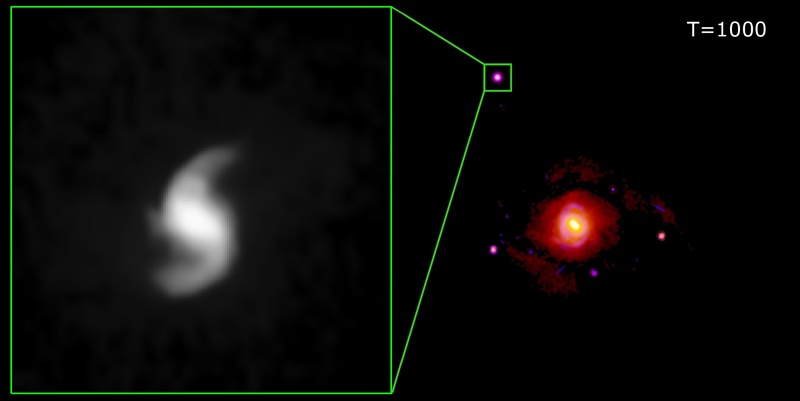 The results of these simulations demonstrate that a significant fraction of dwarf galaxies are formed and survive after giant colisions between massive galaxies. The existence of these galaxies called "tidal dwarfs" may have a major impact on the cosmological theories of galaxy formation. This work is published in the European journal Astronomy & Astrophysics. Massive galaxies like our Milky-Way are surrounded by many dwarf satellite galaxies. Fourteen such dwarf galaxies have already been discovered around the Milky way, two of which very recently in May 2006. Standard cosmological models assume that they were formed very early in the Universe and result from the collapse of primordial fluctuations; they would then have steered clean of the merging process that destroyed many of their congeneric while hierarchically forming the most massive galaxies. Hence, the observed abundance of these dwarf satellites, as well as their spatial distribution, are fundamental tests for cosmological scenarios, that shed light both on the structure of the Universe and the nature of dark matter haloes in which they are orbiting. The number of dwarf galaxies in our Local Group - much lower than expected - is a serious problem for the standard cosmological scenario. Similarly, the observation of an anisotropic distribution of dwarf galaxies around their massive hosts in large surveys, in particular the Sloan Digital Sky Survey (SDSS), has recently nourished many debates. However, before using dwarf galaxies as a tracer of the evolution of the Universe, one should make sure that they all actually have a primordial cosmological origin. Indeed, another process possibly forming dwarf satellite galaxies has been pointed out for more than a decade: when massive spiral galaxies collide, they build up long Antennae-like tidal tails. In these tails, new dwarf galaxies can form: the so-called « Tidal Dwarf Galaxies ». Whether these tidal dwarfs can survive after the collision of their massive parent galaxies, and subsequently have a noticeable contribution to the total number of dwarf galaxies in the Universe are fundamental questions. Up to now, observational attempts failed to provide satisfying answers. Indeed, it is hard to distinguish dwarf galaxies of tidal origin from primordial dwarfs as soon as they are a few hundred million years old. Frédéric Bournaud at the Paris Observatory and Pierre-Alain Duc at the Astrophysical Department of CEA-Saclay have used numerical simulations to resolve this issue. 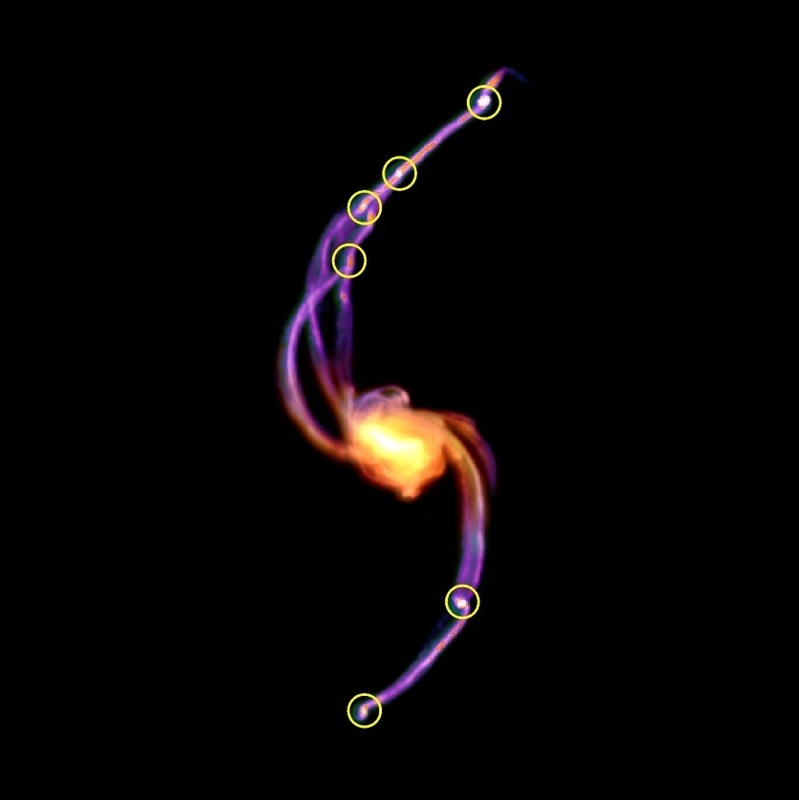 They have simulated in a realistic way nearly one hundred of collisions between spiral galaxies, and identified about 600 dwarf galaxies formed in their tidal tails, which enabled them to study their evolution statistically. They have shown that even if a large fraction of tidal dwarfs are short-lived, about one fourth survive several billion years. These long-lived objects look like new satellite galaxies, orbiting around their progenitor - whose collision is over - exactly like primordial dwarf galaxies. The statistical analysis of the large set of simulations demonstrates that only a few percents of the dwarf galaxies present in the Universe can have such a tidal origin. Yet, this fraction is likely to be much higher in some regions, like the neighborhood of early-type and elliptical galaxies, as well as compact galaxy groups in which the contribution of tidal dwarfs can be as important as that of primordial ones. Numerical simulations also indicate how tidal dwarfs are spatially distributed around their massive host galaxies: their distribution is anisotropic and limited in radius. Then, the presence of these tidal dwarfs is likely to modify the statistical properties of the overall population of dwarf satellites. This must be accounted for before using statistics on dwarf satellites to constrain cosmological scenarios and the nature of dark matter. Lastly, this work proves that dwarf galaxies of tidal origin, formed a few billion years ago in collisions of massive galaxies, certainly exist. Their observational quest is now an important goal, for their internal dark matter content is also a fundamental test. Whether tidal dwarfs contain dark matter or not will help refining cosmological scenarios.